The culinary trends of 2018 build on those things consumers want more and more: new experiences, variety of protein, sustainable ingredients and street-style convenience sourced from every corner of the world. One dish that checks of each and every one of those boxes is Hawaii’s poke bowl. While poke bowl is often labelled as “fish salad,” or a variation on sashimi, that’s not always the case. In fact, you can make them with any type of protein (or none, if you prefer). This versatility, combined with the great flavours, is part of the, if not the whole, reason poke bowls have captured the hearts and stomachs of Canadians over the past two years. “There is a huge shift in lifestyle and diet, which I believe has had a major impact on how poke is being received in Canada,” mentions Wong. 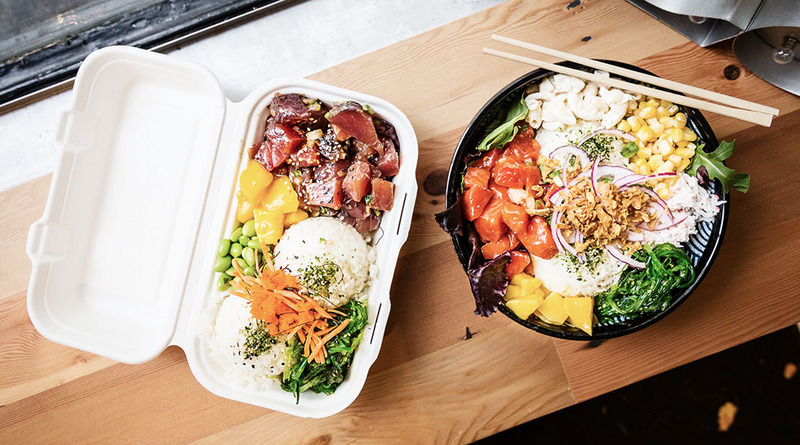 “People are becoming increasingly conscious of what they are consuming and they are actively selecting alternatives, which is where the poke bowl fits in.” The Poke Guy partners with Ocean Wise to ensure that its seafood is sourced sustainably and with respect to the environment. Of course, the fact the poke bowl is delicious also helps quite a bit. The bowl format is very popular in the U.S. and Canada. As Madadi mentions, it started in California, and spread from there. While the contents do change, one theme remains the same in every poke bowl: it always consists of at least three “layers”: the protein, the additions/ingredients and the sauce. If you plan on experimenting with your own poke bowl at home, remember these tips from the experts. The first, is, of course, finding fresh ingredients. The second is to marinate your protein. “If making the traditional shoyu sauce, let the fish marinate for 24 hours before serving,” Nguyen explains, “this will allow the sauce to soak into the fish.” Go easy on the sauce, serve with warm rice, make enough to share and, my favourite, experiment! To me, in the end, the poke bowl is about finding that depth and those layers of flavours that will give you a unique experience with each bite — and remind you just how wonderful nature’s produce can be. So, head to your farmers’ market, find yourself some fish and try out these recipes from the poke experts! We always recommend using wild and sustainably caught seafood. Cut fish into 1/2-inch cubes, set aside. Make the marinade by combining the shoyu, onions, ginger, salt and sesame oil in a bowl. Add the cubed fish to the marinade and mix well so that all the fish is covered. Refrigerate and marinate for a minimum of 15 minutes. Season with some sesame seeds or furikake. We use Calrose rice and Yamasa soy sauce. In a small saucepan over medium heat, combine rice and 2 cups water. Stir, cover and bring to a gentle boil. Turn heat down to low and continue to cook covered on a gentle simmer for 20 minutes, or until the rice is tender and most of water is absorbed. Remove from heat, fluff with a fork and set aside. In a mixing bowl, whisk together the soy sauce and sesame oil. Toss in the tuna, cucumber, and onions, ensuring everything is evenly coated. Transfer the rice to a serving bowl. Top with the marinated tuna mixture. Garnish with macadamia nuts and sesame seeds just before serving.